LA Foundation Repairs is your go to contractor for pier and beam homeowners that need to get their House Leveled in Lafayette, LA. Our team has performed over 1100 home foundation leveling projects over past 9 years. 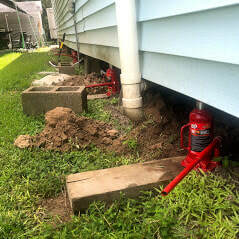 In addition to inspecting the foundation's of close to 2000 pier and beam homes in the Acadiana area. 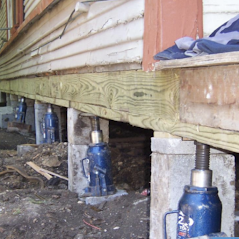 There are a few different ways to level your pier and beam home and over the years, we have developed a methodical home leveling process that is very effective. How to level a house on piers? One of the first things that we determine is the high point in the home. We usually visually inspect the inside of the home to find out where we think that the high spots of the foundation may be. Once we get an approximation, we verify everything with a laser leveling system that we set up underneath the home. We use the leveling system to create a zero plane to start to take our measurements. We verify the high spots in the home by searching for the greatest distance between the bottom of the finished floors and the zero plane set by the laser. We use the beam as a reference to let us know where to begin. Once the high point is determined, we look for anchors on the structure, like a fireplace, or closed in carport, or anything that is attached to the slab. We figure out the elevation of these immovables and speak with the homeowner on our findings. Once we develop an action plan, we either raise or lower the bottom of the finished floors next to each pier to as close to the established "zero" plane as construction will allow. At times, the flooring system has been out of whack for so long that the finished floors at every pier will not sit flat. When this happens, the homeowner is informed and possible solutions or remedies outside the scope of our work are discussed. It is important to note that we are professionals in our field and understand what it takes to get a house as close to level as possible, but did build the house or know when or if it was remodeled while it was out of level, etc. We are sensible and pay attention when we are working through the leveling process, but by no means can predict what will happen when we start to bring things to a common plane. When we discuss the project with you, we try our best to let you know what to expect. 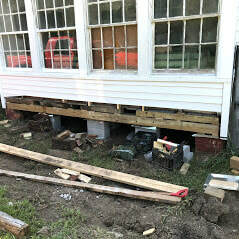 House Leveling on a tight budget isn't fun for anyone, we do and can not determine all the structural members that are rotten before we start the project, but we can inform you of the costs of replacing these members if it is necessary. We love our work and our customers and look forward to working with you on your next house leveling project. If you have any more questions, please feel free to check out our frequently asked questions.